Please read this BEFORE contacting the court. Depending on the violation, some of your options may include: pay the citation in full (points/surcharge fees may be assessed by DPS), request to take a driving safety course for dismissal, request deferred disposition (probation) for dismissal, or plead “not guilty” and request a trial. In addition, some violations may be dismissed with proof of compliance, some requiring a $10.00 – $20.00 dismissal fee. All of these options are discussed in more detail in this pamphlet – CLICK HERE. The Police Department must first file the charge with the court before we can assist you so please WAIT TWO BUSINESS DAYS before appearing or calling. Failure to make a proper appearance by your due date will result in a warrant for your arrest being issued. Your Court date is provided on your citation. It states that you promise to appear “on or before” and a date is provided. You must contact the Court no later than the date provided. No Insurance (Failure to Maintain Financial Responsibility): Citations for no proof of insurance will be dismissed at no charge upon presentation to the court of proof that the driver or vehicle (if you had the owner’s permission to drive their vehicle) was covered by a valid liability insurance policy at the time cited. Insurance coverage will be verified. Expired Registration: Court may dismiss with $20.00 fee IF renewed within 20 business days of the citation, and you provide a copy of the registration receipt to the court. Fail to Display Registration: Court may dismiss with $10.00 fee if registration was current and if registration is properly placed on the vehicle. Expired Driver’s License: Court may dismiss with $20.00 fee, IF renewed within 20 business days of the citation, and you provide a copy of your new license to the court no later than your due date. Fail to Display Driver’s License: Court may dismiss with $10.00 fee upon presentation of a driver’s license that was valid at the time the citation was issued. Fail to Report Change of Address/Name: Court may dismiss with $20.00 fee if a change of address is filed with DPS within 20 business days. Proof required. Equipment Violation: Court may dismiss with $10.00 fee if the violation is corrected prior to appearance date listed on the citation. Proof required. Not applicable if operating a commercial motor vehicle. For Speeding violations, you must contact the Court for your fine amount. PAYMENT METHODS: We accept cash, checks, money orders, Visa and Mastercard. 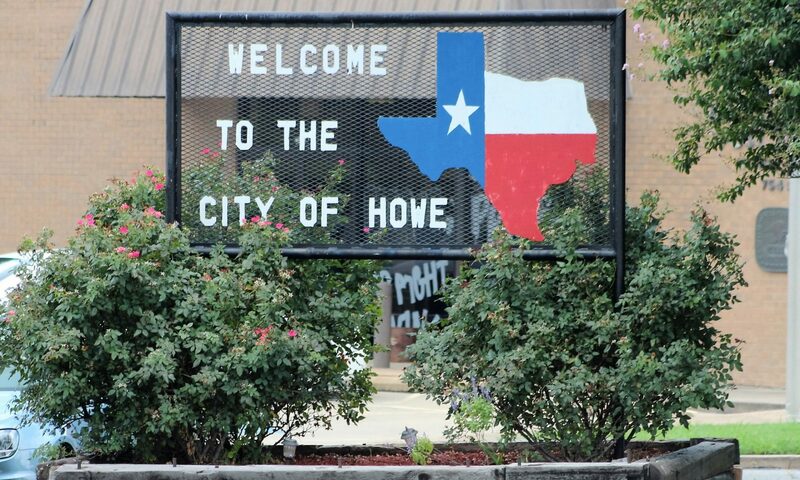 Make checks payable to “Howe Municipal Court”. Credit card payments may be made online for the FULL AMOUNT ONLY. (will be reported as a conviction) or by phone, call 903-532-5571. Pay citation in full – appear in person or mail in payment. Credit card payments may be made as noted below. Submitting full payment for your fine and costs constitutes a plea of no contest and the offense will be reported as a conviction. Driving Safety Course (DSC) – follow the instructions on the back page of the pamphlet. This option may not be available after appearing before the Court. *Drivers under 25 are not eligible to take JUST a driver’s safety course for ticket dismissal, only in conjunction with the Deferred Disposition. Deferred Disposition (probation) – enter your plea below and submit it to the court along with a copy of your DL and proof of auto insurance by your due date. If approved, the probation period could be up to 180 days. If you are under the age of 25 you will also be required to complete the DSC as a condition of the deferral. You will be notified of the terms of your deferral by mail. The required fee for this option will be the fine, state-mandated court costs plus the $50.00 special expense fee). CDL holders are not eligible for deferred. Drivers cited in a work zone with worker’s present are not eligible for deferred. This option may not be available after appearing before the Court. Appear before the Judge – appear in person or mail in your request (postmarked) on or before your due date and a new date to appear will be scheduled for you. Not Guilty – check “not guilty” below and choose either a trial “by judge” or “by jury”. Submit this form to the court prior to your due date and then your pretrial will be scheduled. Court costs of $109.00, or $134.00 (for school zone violations). Copy of your Texas driver’s license and current proof of insurance, listing you as a covered driver. Military personnel and their dependents may submit a copy of their state driver’s license and military identification card. Deferral (off record), includes taking a DSC (state mandate). Once we receive the items noted above, we will send you an instruction letter. You will then have 90 days to complete a Texas Education Agency approved course, and to present your certificate of completion and driver record (DR). If you fail to turn in your certificate and DR within the 90 days, you will owe the remainder of the fine and the violation will be reported as a conviction. All defendants 16 years or younger are required to appear before the judge with a parent or legal guardian. The court will notify you of your court date by mail, to the address listed on the citation. You may disregard the date on the citation. Minors charged with alcohol/tobacco/drug paraphernalia/theft or disorderly conduct offenses must also appear before the judge. If you are under the age of 18, you must appear with a parent or legal guardian. The court will notify you of your court date by certified mail, to the address listed on the citation. Disregard date on the citation. Contact the Court to schedule a trial. Docket days and times are subject to change. Contact the court at 903-532-5571 for information regarding your specific case. When coming to Court you should dress appropriately. Proper dress for men consists of long pants, a shirt with a collar and shoes. Women should wear a dress, skirt or long pants with a modest top and shoes. It is not appropriate to wear a hat.